Usually this time of the year, I’m getting ready for the annual Lakeland Builders Association Parade of Homes. People start calling me for information. We typically will have a home or two in the event. However, this year – we will not have a home in the LBA Parade of Homes, which I know will come as a surprise to many. In the 29 year history of Lakeland Builders Association Parade of Homes, there has been 50 Thelen Total Construction Parade homes. No other LBA member builder has come close to that number of homes. Of course, we could not have done it without the cooperation of those 50 homeowners. For giving us the opportunity to showcase our work, we are immensely grateful. Some of those years have been particularly memorable. In 1998, we featured five homes. Which was a daunting task to have ready in time for the Parade. I think the paint was barely dry on Marilyn Thelen’s Parade home when the doors opened at 11 am! 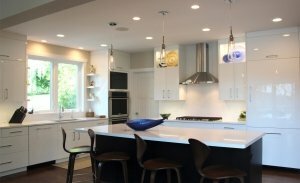 We’ve been very proud to show the many unique styles of custom homes we design and built: From the very elaborately designed grand homes, to the remarkably detailed, smaller scale lake cottages. 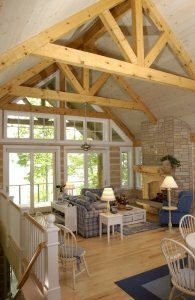 Over the years we have shown English Tudor, Prairie Style, Craftsman, Modern and Contemporary, French Country, Rustic log, Traditional Farmhouse, Modern Farmhouse, a combination of more than one architectural style, and often one of our very popular Lake Cottage style home, on a number of beautiful lakes in Walworth County. Some visitors love to come and see what we have done this year; others are there to find a builder, and possibly become our next client. A number of visitors are people we built homes for in the past. Our Parade Homes do feel like an actual “open house” event when you see familiar faces and friends each year. That part will be missed by all of us. Our objective in having a home (or homes) in the LBA Parade of Homes was to be known as one of the area’s best builders of fine custom homes. A “whatever your heart desires” kind of home. After 50 Parade homes in 29 years, in a myriad of architectural styles, I think the mission is accomplished! So while we won’t have a home in this year’s 2018 Parade, we are very happy to support Lakeland Builders Association and the Parade of Homes by being their Gold Sponsor of the 2018 Event. It is a great opportunity for the public to see beautiful homes built by LBA Builder members. I know I’ll be among the many people attending the Parade. It’ll be nice to be a visitor for a change! For more information about the 2018 Parade of Homes, please visit the LBA website or the LBA Facebook page.